The new Shimano DH-3N72 dynohubs have lower drag than the NX-30, higher quality bearings (comparable to Ultegra hubs), reduced weight, and have occasionally been available in both 32 and 36 hole drillings, though usually in only 32 hole. However we do have some 36 hole 3N72 hubs available. All of these hubs come with hollow axles and QR skewers. There are no bolt-on axle versions. All are compatible with Pitlock locking skewers. The Shimano hubs don't have the very low drag of the Schmidt dynohub, but they're a big improvement over the old NX-30, The 3N70 is the same as the 3N71 which is the same as the 72. I'm not sure why they keep changing the number for the 70-72 series. The Alfine takes Centerlock discs, and is available in both 32 hole and 36 hole. We expect to have them available in black at some point in the future. Since you can read this it means we haven't arrived at the future quite yet. 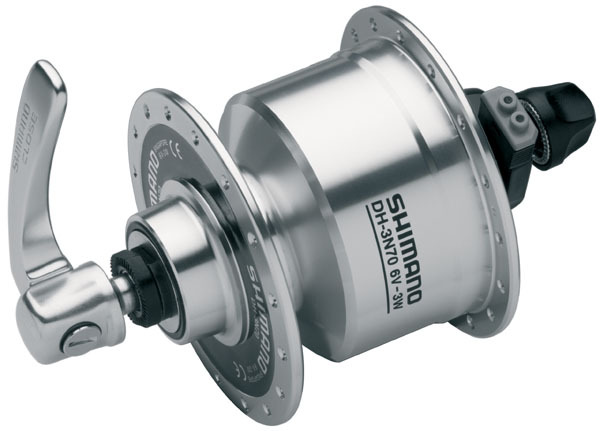 There are no differences between the current 3 watt Shimano dynohubs in terms of drag. There may be differences in terms of the quality of certain internal components, but Shimano isn't giving any specifics, as far as I can tell. This is the Shimano DH-3N70 dynohub. It looks the same as the 3N71 and 3N72. It will power a 6 volt headlight and taillight; in other words, any lights that meet the German requirements for 6 volt lighting systems. Available in 32 spoke with a quick release axle and skewer. We also have a version for disc brake. It's available in 32 spoke drilling only. You may buy just a hub, or a complete wheel built by me with the hub and a Velocity, Mavic or Sun Metal rim. See sample pricing below. Call for an exact quote for the wheel of your choosing. Drag with these hubs is higher than with the more expensive Schmidt hub, but less than with Shimano's less expensive Nexus NX-30 dynohub. The drag is also less than with the Busch&Müller Dymotec 6 or S6 sidewall generator when the light is turned on. For winter commuting, all of the hub dynamos I sell are preferable to sidewall dynamos, since they won't slip when the tire is covered in snow. And, a hub dynamo eliminates the biggest problem with sidewall dynamos: accurately aligning the roller for minimum drag. The hubs can power either a single headlight with a 3 watt bulb, or a 2.4 watt headlight and .6 watt taillight combination. Aside from differences in overall quality, the several dynohubs I sell also differ in performance. The Schmidt is the most efficient of the three. In other words, you do less work to power the lights with the Schmidt that with either of the Shimano hubs. This new Shimano hub are more efficient than the older and less expensive Shimano NX-30. See the table below for a comparison. The NX-30 is discontinued and no longer available. Energy required of the rider to rotate the hub when the lights are turned off at 30 km/h. As you can see, the biggest performance advantage of the current hubs over the NX-30 is in how much drag exists when you're riding with the lights off during the day. And then of course the bearing quality is much higher, since the bearings are the same as Ultegra hub bearings, rather than Shimano's low end Nexus group. The Schmidt uses sealed cartridge bearings, much like a Phil Wood hub. Here is the model name of these 1.5 watt hubs. See this page for the 1.5 watt headlight from Busch & Müller. I build wheels using Shimano hubs. I have many rims to choose from by Sun, Mavic and Velocity and Salsa. There is no Shimano dynohub designed for 20" wheels. You can use it, but the drag will be considerably higher, since the hub is spinning at a higher rate. For 20" wheels, the Schmidt SON 20 is a better choice, since it's designed specifically for smaller wheels and higher RPMs. Call for wheel options. Shipping a wheel within the lower 48 states ranges from $12 to $18 via UPS ground. Of course I can ship via air. Call for rates. All of the halogen headlights are available with either a 2.4 watt bulb, or a 3 watt bulb. If you will be using the system with a wired taillight, such as the DToplight Plus or Seculite Plus, you should use the 2.4 watt bulb in the headlight. If you'll be using the system with just a battery powered taillight, you should use the 3 watt bulb in the headlight. I stock spare bulbs; both 2.4 watt and 3 watt. Don't choose between the 2.4 watt bulb and the 3 watt bulb on the assumption that the 3 watt bulb will be noticeably brighter. It isn't. The 3 watt bulb is needed because the electronic circuitry in the headlight that prevents the bulb from blowing out when you're riding fast assumes a 3 watt draw from the dynamo. So if you use a 2.4 watt bulb in the headlight without a .6 watt taillight connected, the circuitry will not protect the bulb from excess voltage, and the bulb will burn out. First, decide whether you want to have a wired taillight, and if the wiring will not cause a problem on your bike. If you can use a wired taillight, by all means use the 2.4 watt bulb in the headlight, it will provide plenty of light. If you can't use a wired taillight, then get the 3 watt bulb in the headlight. Most LED headlights work fine with or without a taillight. Though if your bike has a suitable mounting option for a wired taillight, there's no good reason not to use one. Some LED headlights (like the B&M DLumotec Ovals) work better if you have a wired taillight attached, and some (like the Inoleds) should definitely not be used at all unless a wired taillight is connected. All Busch & Müller LED headlights with IQ or LYT in the name can be used with or without a taillight and perform perfectly. The same is true for the Schmidt Edelux and all Supernova headlights. Unlike the Schmidt dynohub, the Shimano hubs all ground electrically through the hub's axle. The wire connections still have both power and ground, but you must keep in mind that the axle is also grounding to the fork. A common mistake is to wire the headlightor taillight out of phase. If the headlight is attached to the frame with a metal mount, and if the light grounds to the metal mount, it won't work, since the out of phase wiring shorts with the grounded axle. Some folks have their headlight mounted with a nylon mount, so the headlight is now isolated and works fine. But if there's a taillight connected to a rear rack, it can be grounded through the rack to the frame and may not work if you attach a power lead to the taillight's ground connector. Many of the taillights that mount on a rear rack ground through their mounting bolts, which enables a single wire connection. One exception is the Busch & Müller Toplight Flat Plus. So, you must be sure to connect the headlight to the hub with the correct connections. Connect power to power and ground to ground. Or eliminate the ground wire if you have a metal mount and a headlight that can ground through the mount. Some can but some new ones cannot, like the B&M Lumotec Fly and Fly IQ. Also remember that some headsets do not conduct electricity. Shimano cartridge bearing headsets do not conduct, so the fact that the hub grounds to the frame won't help you getting conductivity to the taillight via the frame. Use a two wire setup to be safe. But be careful about polarity. Even though the hub's output is AC, you still need to maintain polarity. I do recommend that you use both a dynamo powered taillight and a battery powered taillight, if at all possible. If a wire should fail to the dyno powered taillight, the battery taillight makes a great backup. (We now have a very tough coaxial wire for taillights, making this an insignificant problem.) If your batteries fail in cold weather, the dynohub will still be working no matter how cold it is, and the taillight will be very bright. Also, all of the dynamo powered taillights have reflectors, so even if both the wiring from the dynamo and your batteries should fail, you still have the safety of a rear reflector. Redundancy is good. Redundancy is good. Redundancy is good. Stop me, please! Don't these dynamo lights Blow Up? If you do a search on the internet for bicycle dynamo lighting systems, you will undoubtedly come across warnings about lights blowing out if you ride your bike too fast. This is true of systems designed back in the 1920s, and used on bikes such as Raleigh three speeds up through the early 1980s. These were very crude systems by today's standards. While you can still buy cheaply made dynamo lights that will blow bulbs on a downhill run, none of the systems I sell are so poorly made that you have to concern yourself with this. Without exception, every headlight I sell for use with either a hub dynamo or sidewall dynamo incorporates circuitry to prevent the overvoltage of the bulb. You have absolutely nothing to worry about. For Busch & Müller headlights, see this page. For Schmidt headlights, see this page. For Supernova headlights, see this page. For Spanninga headlights, see this page. For Schmidt taillights, see this page. For Busch & Müller taillights, see this page. Busch & Müller taillights are compatible with Busch & Müller, Schmidt and Spanninga headlights. They are not compatible with Supernova headlights. For Supernova taillights, see this page. Keep in mind that Supernova taillights, as of 2013, will work with other brands of headlights. However, since Supernova has the circuitry for the taillight's standlight in the headlight, your Supernova taillight will not have a standlight unless you are using a Supernova headlight. For Spanninga taillights, see this page. Spanninga taillights are compatible with Busch & Müller, Schmidt and Spanninga headlights. They are not compatible with Supernova headlights. Unlike the Schmidt SON and Busch&Müller dynamo powered lights, and battery powered lights, I do not wholesale any Shimano products, including these hubs.